Expert Sleep Medicine is moving to a new office in Bardstown. Drs. Warren Shaikun and Christopher Howerton will continue to see patients for sleep disorder diagnosis and treatment. Our current office, located in the Flaget Medical Office Building at 4359 New Shepherdsville Rd, will stay open for appointments through October 31. The new location provides added space to better accommodate our growing patient population. 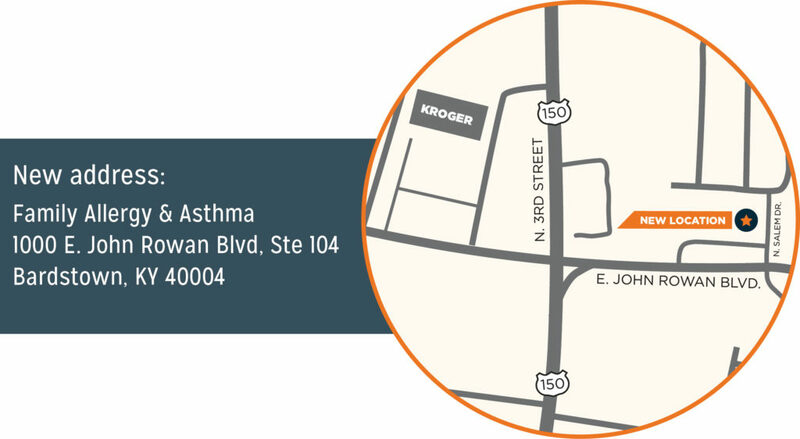 The new office will be located within Family Allergy & Asthma‘s Bardstown office. We apologize for any inconvenience this may cause our current Bardstown patients. If you have an appointment scheduled on or after November 7 in Bardstown, you should have received a call to reschedule your appointment at our new location. If you have any questions, please call our scheduling staff at 502.962.0487. Expert Sleep Medicine was founded in 2013 by Dr. Robert Karman. Joined by Warren Shaikun, MD, and Christopher Howerton, MD, Expert Sleep focuses on treating and diagnosing sleep disorders. In 2016, the practice joined Family Allergy and Asthma to allow the growing practice to focus on patient care. Drs. Karman, Shaikun, and Howerton work in several offices throughout the Louisville Metro and the surrounding counties. After scheduling an appointment, please use the link below to find directions to the office of your appointment.